This is the main thread for my new project, the Music Thing Radio Music Sample Player. It's a 4hp module that behaves like a Voltage Controlled FM Radio or a Shortwave Radio, but is actually playing files from a SD Card, without the problems of actual live radio reception. 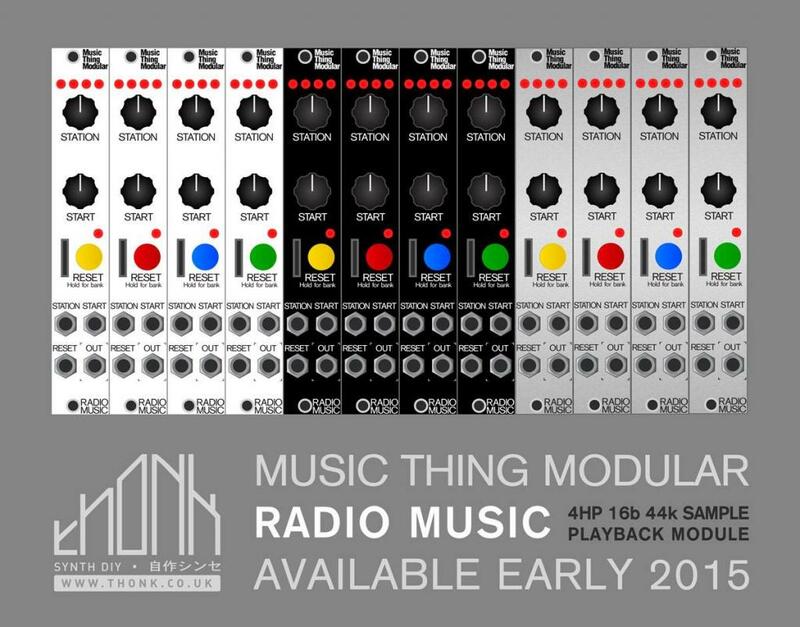 Why would anyone want a radio station in a modular synth? - Station pot (and CV Input) This is how you choose which file to play from the current bank. It works exactly like a radio tuning knob. Like real radio stations, the files loop endlessly and continue to play in the background - they don't re-trigger each time you select a new station. If you turn on the module and wait 5 minutes, then switch to a channel playing a 30 minute long radio recording, it will be 5 minutes in. - Start pot (and CV input) This sets where the file will start playing from from if you press the RESET button. - Reset Button (and trigger input) This restarts the current track at the point set by the Start pot. - The module creates a settings.txt file on the SD card. By editing this, you can change how the module behaves; how quickly pots respond, how clicks are suppressed. 2) with a fast enough clock can you "scrub" the sample position with a saw tooth wave? > ...ish. If you edit the settings.txt file you can get the module to respond in a fast, raw, noisy way without the affordances that normally make it a bit more smooth. Is there anyway you can get it to keep memory of all settings after a power cycle? Does that mean that once you trigger a station, leave it, then come back- the playback position will have followed in real time and it picks up at the current position rather than the position where you left off? I mean i really like the whole radio concept and think its awesome for long samples and recordings (conceptual yes!) but i was also planning on using it as a one-shot sampler. For various reasons. >You can probably do this - ie fill up a folder with one shot samples, choose a sample by voltage, then trigger it from the start using the reset trigger. >Would be easy enough to add a 'don't loop' option on the SD card if that turns out to be useful. Do we have ways to write to SD cards in modular yet as a function of sample recording? is it an fm radio that samples it's own stations? does it sample outside sources? >is that it's a sample player with a radio-like interface. >So you can load up a bunch of Conet Project samples and it's like the easiest SW radio ever. Any idea of when ? Will it be a DIY kit ? I'm already collecting samples to put in it! Stand out work as always, Tom. I'm assuming you're using the onboard PWM for audio output as I don't see a DAC. I'm curious how you feel about the audio quality trade-offs and what factors led to this design decision. Is the code written using the teensyduino tools? The Teensy 3.1 has an on-board 12-bit DAC. I've been very happy with the sound - it's probably more Akai S900 than Pro Tools HD, but it's full range, loud and clear, as you should be able to hear in the audio demos. Yes, it's all Teensyduino - I've modified a couple of functions in the library a little bit, but it's basically stock, so is really easy for anyone with basic arduino skills to get started. EDIT: nvm, I was being lazy, I looked it up myself. Thank you tom for another amazing module! 2) Do you envision one will be able to buy just the circuit board without the euro panel? This is a pair of super tight boards - there are no mounting holes, no screws/spacers connecting the front and back boards, just panel mounted pots and headers/sockets connecting the two boards - so it might be harder than some other designs to hack into a different format. OTOH, it's so tiny, you could probably make a quad sample player in one of the big formats. people have indeed done this. but doing more than stereo with separate outputs wouldn't be feasible with i2s devices (which most decent audio DACs are), and SPI/DMA isn't currently supported by the API so .. possible maybe, worth the trouble probably no. people have indeed done this. but doing more than stereo with separate outputs wouldn't be feasible with i2s devices (which most decent audio DACs are), and SPI/DMA is currently supported by the API so .. possible maybe, worth the trouble probably no. ups. typo - i meant to write "SPI/DMA isn't currently supported by the API so ... " . anyways, it's perfectly possible to stream several files so adding additional clock inputs will be an easy mod. Will there be an already built version ? Have started purchasing for the first run of kits. January definitely seems possible right now. The mailing list doesn't specify how many kits people are interested in. I definitely want two please. I've already got an unused Teensy 3.1. It would be great to have a PCB/panel option sans the Teensy. Would two of these with the same "stations" saved on their cards stay remotely in sync after a "reset" pulse? I ask as two thoughts come to mind; stereo files and timing pulse tracks. I'm actually more interested in the second option, I know this isn't supposed to be a sampler, but I'd like some way to sync up the stations with the rest of my modular beyond the reset input. If anyone in North America would be willing to build an extra one for me, please let a dude know. - A bit more panel space, and at least one SMD component - thats why I didn't do it. I read about this last night but couldn't watch the video at that time ... mind blown. Watched the video finally this morning. Gobsmacked! Can't wait to build one. Added my name to the Thonk notification list. Incidentally, thanks for making stuff to build that isn't SMD ... my vision doesn't go that small!